AALL wishes happy holidays to you and your families! Join us for this Add+Venture—April 25-26, 2019 in Chicago. 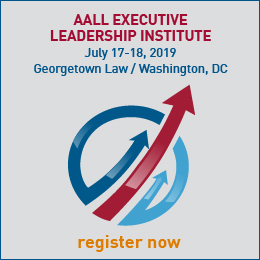 AALL and its Executive Board need your leadership and expertise. This is your chance to help lead the Association dedicated to advancing the profession of law librarianship and legal information. AALL is seeking volunteers to serve on one of its 24 committees and award juries. Please consider lending your time and talent to AALL. Please use the links above to review the committee and award jury charges, as well as the time commitment for service. The online application opens January 7, 2019. Apply or nominate a deserving colleague, library, or company (including your own) by February 1, 2019. 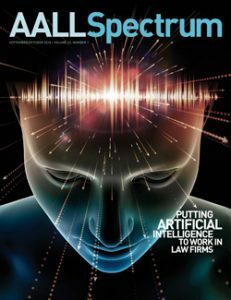 Recipients will be recognized at the 2019 AALL Annual Meeting & Conference in Washington, DC. Mark your calendars for AALL Day on the Hill: Advocacy Leadership Training & Lobby Day, taking place just before the AALL Annual Meeting & Conference in Washington, DC. 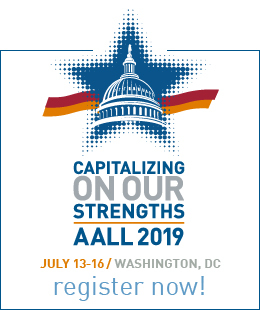 You’ll learn about the information policy issues on AALL’s agenda and how to successfully advocate for law libraries, and then take our message to Capitol Hill for meetings with your members of Congress and their staff. Issues may include copyright, access to legal information, open government, and privacy. Registration will open in early 2019. Applications will be accepted until February 15, 2019 and interviews will be conducted via conference call at the end of February. To help with the transition, the candidate selected will sit on the remaining conference calls for volume 23, working with Niedringhaus and the Editorial Board until July 2019. Blockchain is not limited to purchasing items with cryptocurrencies. In fact, Distributed Ledger Technology, a type of Blockchain, is already having an impact on the legal community—it is used to track and store data on individual’s educational achievements, track titles on property, authenticate government documents, create wills or contracts, and keep inventory of goods and their locations. During their presentation, Debbie Ginsberg and Dan Blackaby provide an in-depth look at the many uses of Blockchain. As we reflect on the year, many of us wish we had been more present in our personal lives and more deliberate in our work lives. We resolve to finally figure out how to have a better work/life balance, or at least to better integrate the two, in the year to come. As leaders, we can work toward a better work/life balance for ourselves and encourage our colleagues and employees to do the same. While modeling a work/life balance is one of the best ways to inspire others as a leader, we can also support employees by offering flexible schedules, helping employees set priorities, and encouraging vacations. Tarica LaBossiere was selected as the AALL Diversity & Inclusion Committee’s December Librarian of the Month. Holly M. Riccio has been appointed Senior Manager for HBR Consulting. John Tessner served as head of public services at the Hamline University School of Law Library in Saint Paul, Minnesota for 18 years until his retirement in 2005. Tessner earned his MLS from the University of Wisconsin-Milwaukee in 1973. In 1975, he tutored patients at Central State Hospital in Waupun, and soon after, worked as a teacher on the forensic units at Mendota Mental Health Institute in Madison. In 1981, he enrolled at Gonzaga University Law School and graduated in 1984; he was admitted to the Wisconsin Bar that fall. In 1986, he moved to Little Rock, Arkansas, and worked as a librarian at the University of Arkansas-Little Rock Law School Library before taking on his role at Hamline. Tessner was a member of AALL from 1984-2006 as well as a member of the Wisconsin Education Association. He was also a life member of the National Education Association. He passed away November 27, 2018. 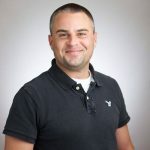 In this month’s member profile, David Holt, reference librarian at the University of California Davis School of Law in Davis, California, talks about the importance of getting involved in special interest sections, and why he can’t imagine life as a law librarian without AALL.